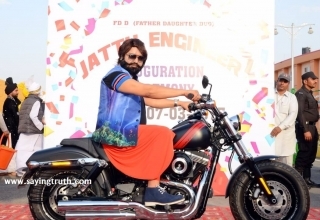 On 5th October at the jampacked KD Jadhav stadium in the Indira Gandhi Sports Complex, the premiere show of Saint Dr. Gurmeet Ram Rahim Singh Ji Insan’s upcoming film ” MSG The Warrior-Lion Heart” was attended by thousands of fans. 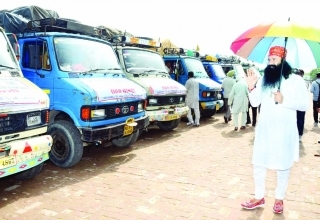 Guruji himself rode on his modified SUV trike in the city to attend the function and it was a real traffic stopper. 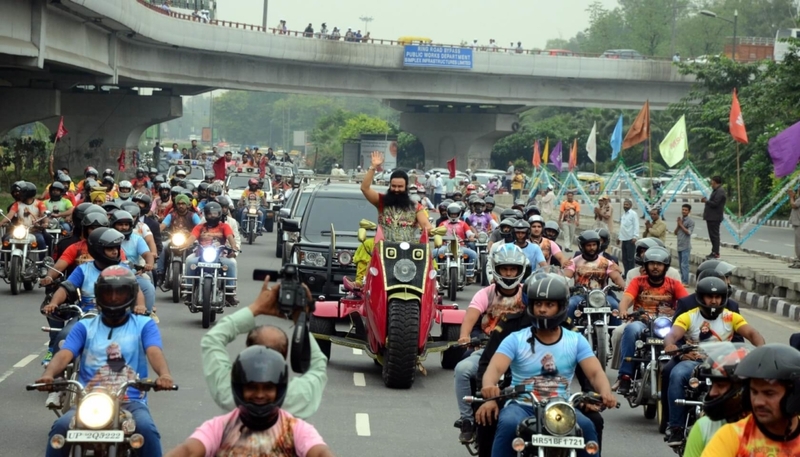 Led by a cavalcade of bullet motorcycles, MSG wowed Delhi as everyone seemed desperate to catch a glimpse of him and his novel three-wheeler SUV. BJP leaders who attended included Kailash Vijayvargiya , Arun Singh, Orissa MP Dr. Prasanna Kumar Patsani, East Delhi Mayor Satya Sharma etc. Boxer Manoj Kumar was among a host other dignitaries who attended the show. Guruji had an interaction with the press in the beginning and shared many interesting facts about the film. His daughter and co-director Honeypreet Insan also answered media queries. Thousands of ecstatic fans reached to the stadium along with the film’s cast. It was a real carnival with long festive queues outside the stadium. The fans wore Lionheart T-shirts and celebrated by dancing, singing and hooting. Scheduled to be released on 7th October, the first half of the film was shown in the premiere. And the fans went ballistic and savored every moment. MSG’s different styles and the film’s action scenes were extremely well received by the fans. At every high point, people couldn’t resist whistling and hooting on the songs and dialogues. The film is all action and high drama and the rich heritage of India is depicted brilliantly. The two songs of the film ‘Dhol Baaje’ and ‘Varsha aayi’ have become super hits. 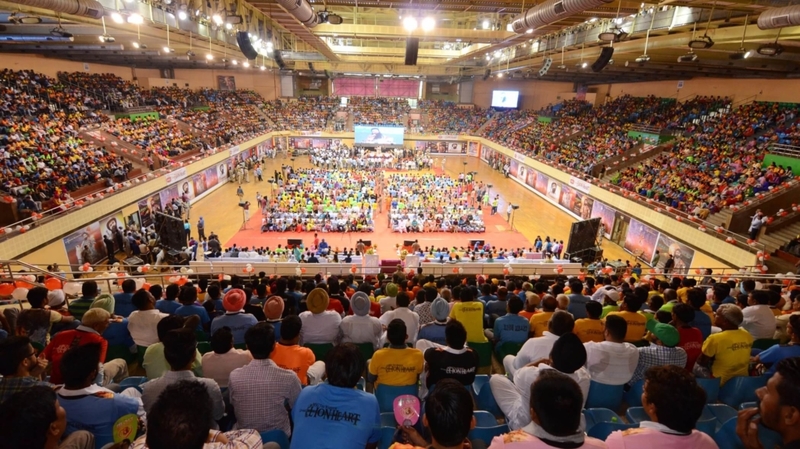 5 giant LED screens were put up in the indoor stadium with a mega wattage surround sound system and the fans looked resplendent. Fans now eagerly await October 7, the day the film hits theatres. 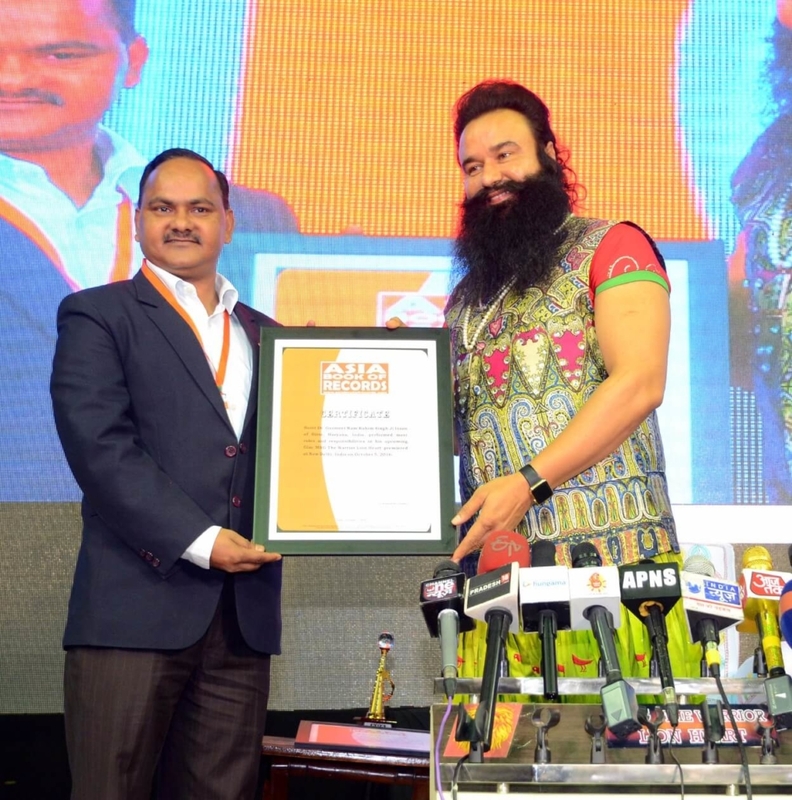 Asia Book of Records representative Manmohan Rawat gave 2 new record certificates and trophy to Guruji. 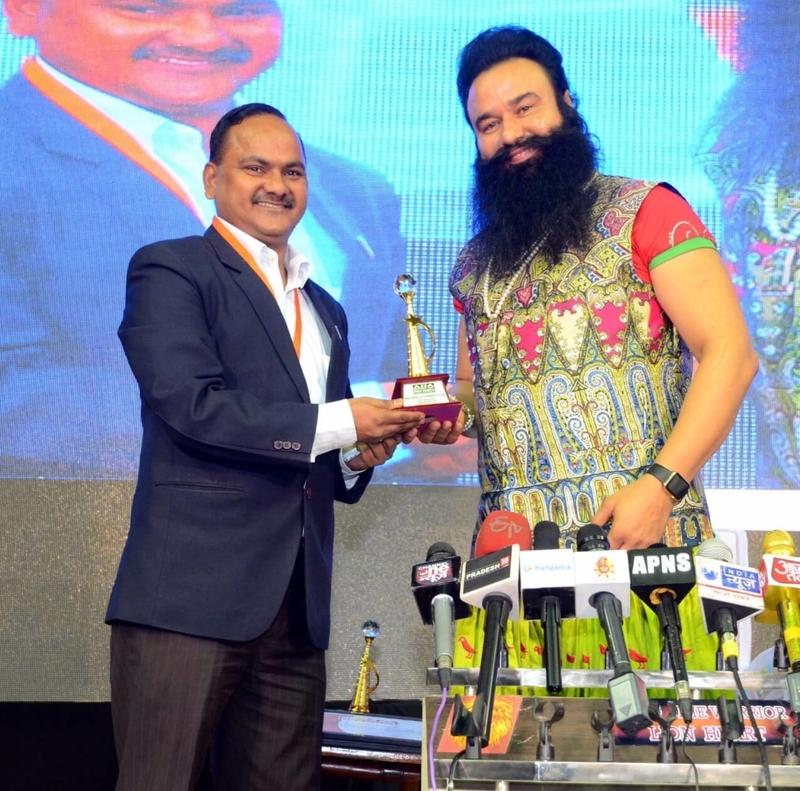 Now Guruji has 58 world records in his name. On Wednesday (6th Oct, 2016), two new records were made for most credits in a film and for the largest number of oil lamps lit. Both records are for the movie MSG The Warrior-Lion Heart. For the promotion of the film on 23rd September, 1 lakh 50 thousand and 9 oil lamps were lit up by the fans. The second record is for Guruji who has earned 30 different credits in the production of this film. While interacting with media persons, Guruji said that he will be seen as a character and not as Guruji in MSG The Warrior Lion Heart. Guruji has portrayed 3 roles in the movie. It includes being Lion Heart, an ultra modern secret agent, a traditional Rajput warrior from 300 years ago called Sherdil and that of one of their ancestors. Guruji said that he is making the young generation aware of India’s rich culture through films. Other filmmakers have forgotten our culture by showing poverty in India. 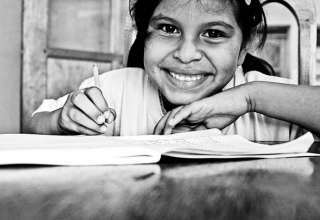 He said that religious education should be mandatory for all, as well as military training should be mandatory. When asked about the politicians who are questioning the surgical strike on the terror hubs in Pakistan, Guruji had a befitting reply for their comments. He said that those doubting thomases should be pushed alongside the army and should be made to join the action right up front. Once they suffer bullets first hand, they would not have any doubts left. 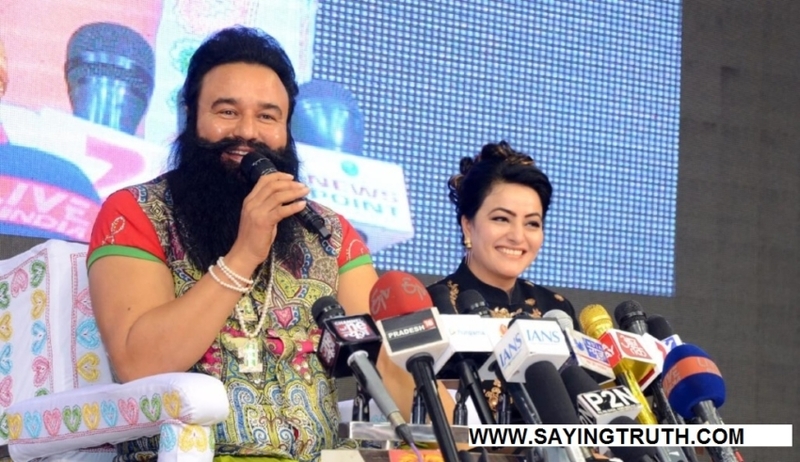 Saint Dr. MSG said he has also written a film on terrorism and the film will come out soon. He was approached by several artistes from the film industry who are willing to collaborate. 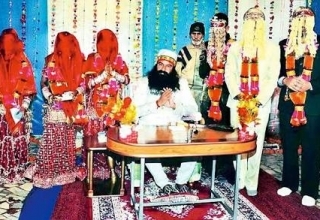 He said he is a Spiritual Saint and he will remain the same. And everything he will do is meant to remove evils from the society. He said that there is a lot of entertainment in this film with the message cleverly intertwined. He also announced that LionHeart series will continue further.